HYDERABAD: As world prepares to celebrate the World Labour Day, millions rather billions lament their lot for not even qualifying to come under the ambit of labour laws. Sixteen-year-old Tehmina a bangle worker is bed-ridden due to meningitis and facing disability because of the neurosurgery. The surgery has affected her left hand and leg besides slurring speech. Now, she can’t share her pool as do rest of the family, says her mother 53-year-old, Zaibunnisa. People associated with bangle industry, hotels and working as domestics in homes, schools and private offices have no right to claim benefit as they don’t fall under Labour Laws. There is no official data to confirm number but it runs in millions in our part of the world. None have an access to services under labour laws as they are not allowed to form trade union and have no say in labour rights. Labour federations are trying to bring informal workers under the cover of law and once it’s done their exploitation would come to an end. Informal workers are not organised as majority of them are busy in providing two square meals to their families and recreation or luxuries are far-fetched dreams to them. Mutton is beyond their means, and beef or chicken is a luxury which some enjoy on special occasions. Tehmina’s condition is apt to make anyone sad as she lies on a cot without a sheet and constantly needs assistance for the slightest movement she intends to make. She needs a lot of money for consultation and medication. Even the rights of those having access to labour laws are not safeguarded because of capitalist-dominated system where pocket unions kill economically, the working class. The government has fixed Rs6,000 as minimum wages which are not being implemented in majority of cases. Sky-rocketing inflation is exposing these workers to many types of social ills while health-care and private education are dreams unfit for their eyes and public sector education, too awry, to describe. 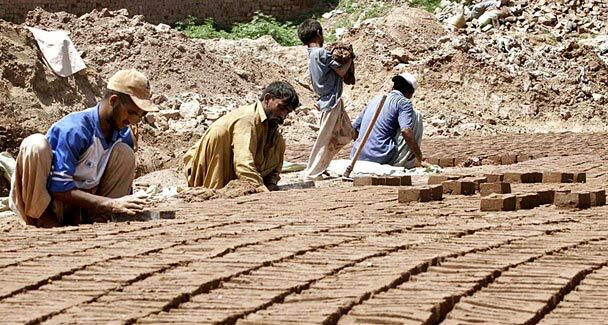 Workers can be blamed for their plight as they are too hesitant to file a complaint or get themselves registered with the Workers Welfare Board, said convenor of sub-committee of National Assembly’s standing committee on labour. Many workers federation are shy to get trade unions registered on the pretext that it lands a labour in trouble. Secretary General, Khursheed Ahmed of Pakistan Workers Federation said that the government has done nothing in regard to IRA 2008. “Bangle and domestic workers are most exploited class and they must be covered under law through legislation by government forthwith to check social exploitation”, he said. The government’s decision to repeal Removal from Service (Special Power) Ordinance 2000 introduced by Pervez Musharraf was hailed by all. However, labourer federations flayed government’s plans to replace IRO 2002 with Industrial Relations Act 2008 without taking them on board. “Its poignant that while dictators always consulted labour leaders democratic government avoid them and thrust their decision on us”, said a noted labour leader, Qamoos Gul Khattak. The government introduced Industrial Relations Act (IRA) 2008 in place of IRO 2002 for an interim period, promising more suitable amendments by April 2010 through IRA 2010. IRA 2008 would now stand expired and there had been no consultations with the workers federation. Employers and workers’ federation jointly worked out a consensus draft called “Workers Employer Bilateral Council of Pakistan” (Webcop) and submitted to the government, seeking amendments in proposed IRA 2008, including right to trade union in agricultural and informal ones except army and police. Labour federations say that while the government has done away with some workers-friendly provisions of IRO 2002, it has also inserted some anti-workers clause. They viewed it with concern that while dictator’s name has been expunged and all those amendments are deleted why those harmful for workers’ right are kept intact. “IRA 2008 is a rehash of 1969’s Labour Ordinance given by Ziaul Haq”, said Khattak, who is secretary general of Muttaheda Labour Federation. He referred to clauses that are done away with like appointment of appellate tribunal and the NIRC by respective chief justices, union’s affiliation with registered federation within two months of elections, punishment to employers, etc. “When two stakeholders – employer and workers – have signed a consensus document then why the government avoids playing its role of facilitator”, he asked.